Sometimes, dogs and owners seem so in sync that what they can achieve together is simply beautiful. 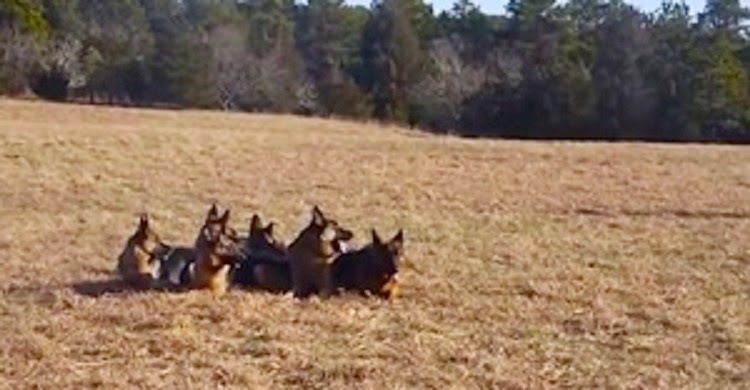 Take this video, for example, which shows a dog owner and trainer with seemingly unbelievable control over his pack of German Shepherds — to the point where no leash is required while out exploring the local park. A lot of love and time went into training these beautiful dogs. When he takes that leap over the pack, I couldn’t believe my eyes. All of their attention is on him — even when the woman and her small dog approach the pack, they all look to their owner to watch for his commands. We’ve seen patient, well-trained dog packs do amazing things before, so I can only imagine how long it must have taken to train this pack. Please weigh in on your thoughts about this video, and SHARE it with your friends on Facebook!